Hello and Happy New Years everyone, I appreciate you checking out this guide. The bridge between all-in and macro is shorter than you think. Both styles require you to develop essential skills and mechanics. Both styles require you to incorporate a high level of structure and precision with your build. Both styles require you to have fundamental understanding of both your own strategy and your opponent's. The only difference between a macro player and an all-in player is the way that they approach the game. There is nothing wrong with the notion that playing macro Zerg is an effective way to improve at SC2; but there is a tremendous deal wrong with believing that playing macro is best or only way to improve. It is essential to explore a wide range of styles, because there is a lot of value to variety. Too often the term "all-in" is cast about in a negative light. People wrongly claim that all-in styles are not effective for improving overall mechanics and skill. But I'm convinced that if more players embraced the style and mindset of an all-in aggressive player, they would find the edge that they're looking for. ~4:15 | 8 Roaches and 24 Speedlings arrive at opponent's expansion. **NOTE: This timing does not work well on maps with in-base expansions like Orbital Shipyard and Dusk Towers. It is ideal for maps that have large expansion ramps (Prion Terraces, Ruins of Seras, Lerilak Crest, Ulrena, and Central Protocol are all viable). Also, the defensive power of the Mothership Core needs to be highly respected in the current meta. Executing this style effectively revolves around baiting Overcharges and sniping Pylons. With proper execution, this style is effective in the current meta, and will only get stronger if the Mothership Core's defensive abilities are nerfed (please??). Let me be clear. This attack is meant to win the game; in an ideal scenario you will not have to worry about transitioning. However, I believe that no all-in is truly complete without another follow-up all-in. This section will list the full recommended build order, as well as explain how preliminary Zergling pressure can soften your opponent for the real attack. This section will explain the execution of the attack itself: when to arrive, what to target, and how to deal game-ending damage. This section will list the transitioning steps in the event that your opponent survives your attack, and you need a quick follow-up all-in. There are also two reference sections called Replays and Tutorials. **So these initial Zerglings that you build are the most precious things in the world, and how you manage them will largely determine whether you win the game. First off, you can deny the Probe scout easily, and hopefully prevent the Protoss from scouting your Roach Warren. Also, you can immediately pressure your opponent's expansion (as early as 2:45). Your real goal is not to do any kind of damage -- but if you can kill a Pylon or Probe by all means! 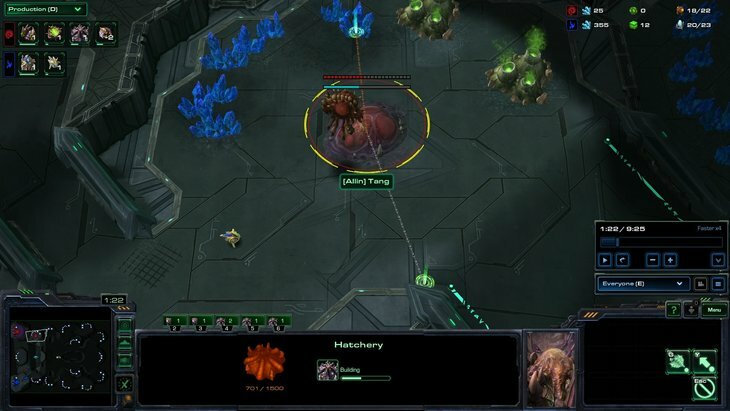 The main purpose of the early Zerglings is to bait Photon Overcharge, then just run away. Bait Overcharge. Run away. Don't lose Zerglings. You keep your opponent in the dark while softening them up for the real attack. The primary target when engaging is your opponent's pylons. 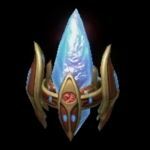 In addition to eliminating supply and de-powering cannons and gateways, Pylons are especially valuable targets because they are now incredibly potent defensive tools. That's why we talked about baiting the Overcharge energy from the Mothership Core, the fewer Overcharges the more damage your Roach-Ling will do. A Photon-Overcharged Pylon does approximately 32-33 damage per second to Roaches and Zerglings. Comparatively, Adepts do approximately 6 damage per second to a Roach and 14 damage per second to a Zergling. Do not make the mistake of ignoring a newly-cast photon-overcharged Pylon! It lasts for 11 seconds and will chew through your units. Either focus it down quickly, or avoid it entirely. Photon Overcharge currently only costs 25 energy, which means most times your opponent will be able to cast at least 2-6 Overcharges by 4:15. That is why your initial Zergling pressure is so important – you can easily force a few Overcharges even though you do not plan on engaging. Then when your Roaches arrives, the Mothership Core will have less energy and you can quickly focus-fire the remaining Pylons. If possible, always position in such a way that all 8 of your Roaches can attack a single Pylon. 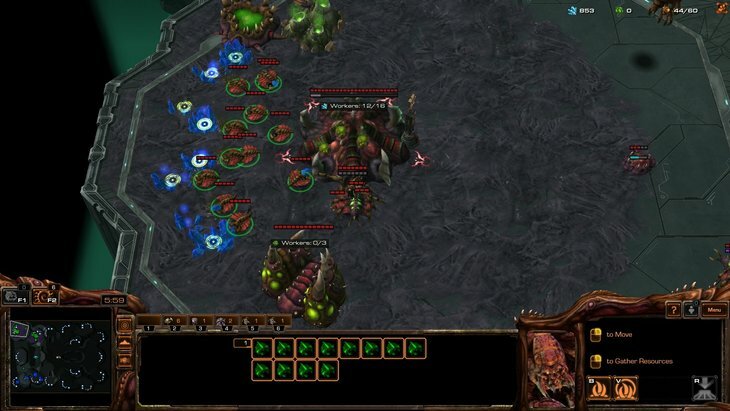 Hotkey your Roaches and Zerglings on separate control groups so that you can execute this type of micro more efficiently. 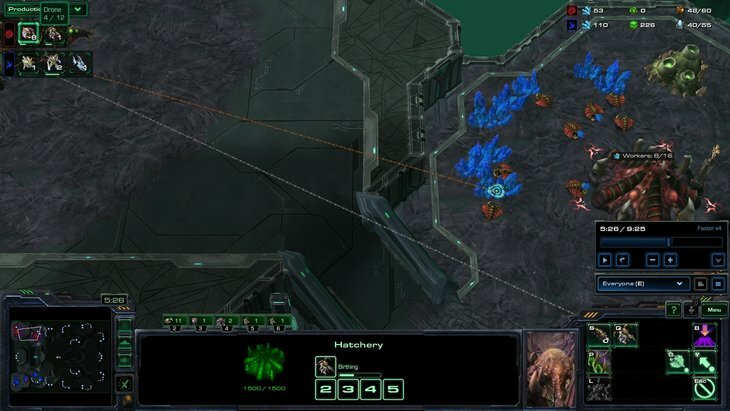 It takes about four volleys of your Roaches (less if Zerglings are helping out) to kill a Pylon. 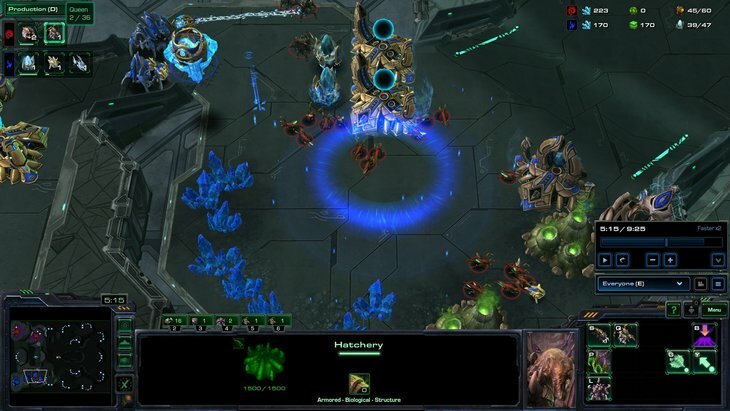 Take them out quickly with focus fire, and your Roach-Ling will overwhelm the Protoss base. If you're not able to get the jump on a Pylon before the Overcharge, you may disengage it (move out of the Pylon's range) and prioritize other essential structures: Cybernetics Core, Expansion Nexus, Other Pylons, Other tech (Robo/Sg). 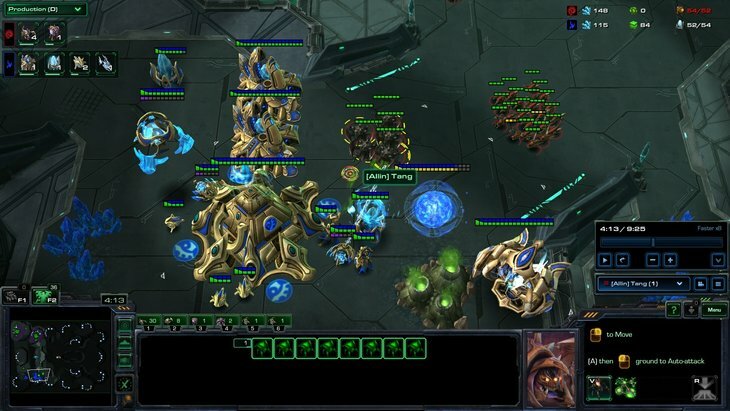 Most Protoss will not use their Probes as part of the defense; but if they do, you absolutely can trade Roach-Ling for Probes. It'll be a one-sided fight. You can also target units like Sentries/Stalkers/Zealots/Adepts, as they will drop quickly in small numbers. It is important to distinguish between when it is correct for your units to be move-commanding, attack-moving, and hold-positioning. These are largely the three commands you will be issuing: either you'll right-click a target, or you'll A-Move towards your opponent's workers/units, or you'll hold position (usually out of Photon Overcharge range ). How you use these three commands really depends on the situation, but it's important to be aware of the different ways you can control your units. What you don't want to do is chase his Probes or units around while he has Pylons up and Gateways warping in. Prioritize Pylons, and render the Gateways and Mothership Core the way they should be: useless. Then you can decimate the Probe line and/or destroy the expansion Nexus. That is how you do game-ending damage. However, there will be some situations where it is incorrect to push up into your opponent's main base. You will ALWAYS be able to push into the expansion aggressively (it is too early for them to deny you); but you won't always be able to move up the ramp into his main. In that scenario, it is actually correct to focus down the expansion Nexus and transition, rather than risk a cost-inefficient trade up a narrow ramp. A one-base Protoss is essentially crippled, and they will have to either slowly retake his expansion, or do a desperate 1-base all-in. If you execute your Roach-Ling attack and you are unable to either a) kill his expansion hatchery or b) cripple his economy and infrastructure, then you have probably already lost. That is the nature of an all-in; no qualms about it. The attack is a significant investment for you, since you will be very behind in terms of tech and still without a third base. But if you're able to destroy a Nexus and/or the majority of his infrastructure/Probes, then you're in great shape and you can even transition into a longer game. In theory you could transition however you’d like, however I recommend some variation of a 2-base 3-4 gas follow-up -- Roach-Queen-Nydus or Speed Roach-Ravager or Hydra-Ling-Roach. Not too greedy, something like starting unit production at 40-44 Drones. That way you can either defend a counter all-in or attack again yourself. If you play too economical/passive after the first attack, you risk losing the game or at least your advantage in it. Too many players make the mistake of executing early pressure, then droning to full three-base saturation. It does not work that well in LotV because your main mines out quickly so you end up actually needing to take a fourth to sustain 60+ workers. Plus your opponent is very likely to attack you again while you're droning for such a long period. Unless you have a very clear read on your opponent and feel comfortable playing 3-4 base macro against it, I would recommend a more short-term solution . The first step should be to get a minimum of 38 Drones in the mid-game to saturate 2 mineral fields (32) with 2 gas (6). With that benchmark in mind, you'll probably refill the first gas pretty quickly, and start the second gas and Lair around the time you're reaching 16 on the minerals at both main and natural. Eventually, you'll have enough Drones to take the last 2 gases without compromising your 2-base mineral economy. Contrary to economic theory from HotS, you do not always need to fully saturate your main (16). You definitely want to do it in the early stages; but by around 5:30/6:00, half of your mineral patches in the main will be getting low. One way to adapt to this change in LotV is to keep 12 Drones mining in the main instead of 16 -- that way you are only single-mining the far back patches which will preserve them a little longer. This tactic helps to balance your economy, especially when you’ve already been on one base for so long. Once you hit 40 Drones, you have the perfect 2-base economy for this stage in the game: 12 Drones mining minerals in the main; 16 Drones mining minerals at the expansion; 12 Drones mining gas from the 4 extractors (total 40). Perfect! It works out to about 1,100 minerals and 450 gas per minute, which allows you to afford a nice-sized mid-game army. At this point, start your Nydus, switch back into Roach production and mass Queens from both hatcheries. You should have about 6 Queens minimum when the Lair finishes, and should continue producing them until you win. 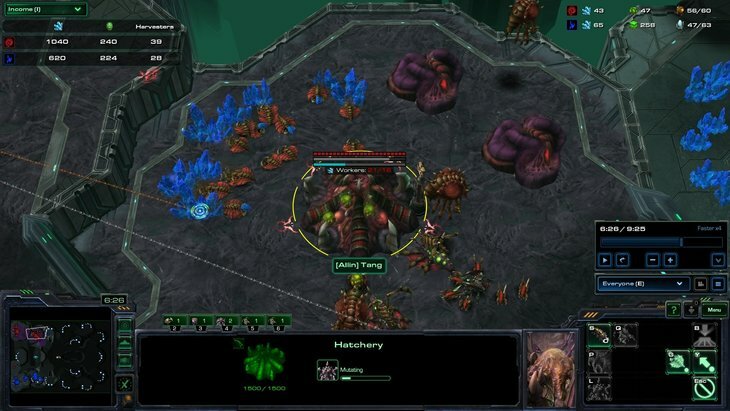 Load up your Nydus with Queens then Roaches, and plop the Nydus in the Protoss main. Transfuse the Nydus, spread creep and engage relentlessly! The six-replay pack can be downloaded here. Note that many of these replays feature the pool-first version instead of the hatch-first version, which was an oversight on my part. I will likely put together another replay pack specifically on the hatch-first version ASAP. 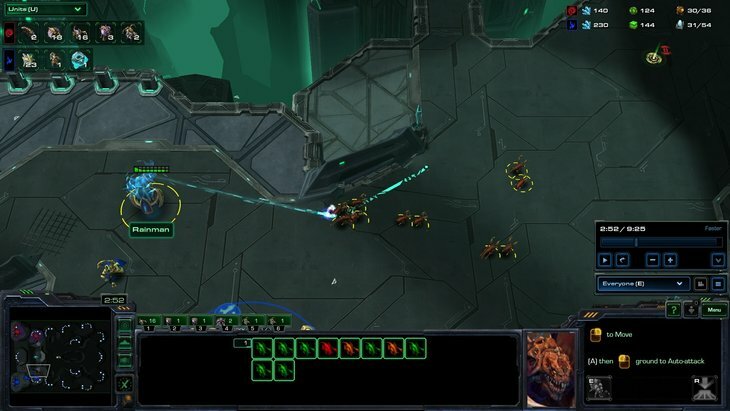 These tutorials feature my own games played at the top master/GM opponents on NA and EU servers, because frankly that's all I have, but as soon as Snute sends me some replays I promise to do analysis of that! This guide was written, edited, and produced by All-In Academy SC2 Coaches. If you are interested, please consider filling out a free student assessment. The survey is short and designed to help determine how we can best help you improve. Based on the assessment, you will be assigned a coach who specializes in key areas of SC2. They will contact you via email and provide whatever guidance you need to play and improve more efficiently. sick adding to my thread much appreciated will try it out! Nice idea, i'll try it for sure. BUT PLZ,stop adding those stupid replays ! Well the Pool-First and Hatch-First versions are almost identical, I explain it a little better in the tutorials...but you're right! I should have included more of the hatch-first version since that's the one I included in the guide. Thanks for the suggestion, I put a new note in the replay section: "Note that many of these replays feature the pool-first version instead of the hatch-first version, which was an oversight on my part. I will likely put together another replay pack specifically on the hatch-first version ASAP." Ty, btw i tried it and it's pretty strong ! Love the details in Tang guides, I just wish he wrote Terran guides instead. Looking to try this on ladder in my next ZvP. Looking for Terran guides? :^ ) Ask and I might do another. But can you do it Tang style with tons of screenshots and incredibly detailed? Go look at my other guide and tell if it's good enough. It's somewhere on the Strategy Forum List. Up to you to judge. I've been thinking about doing a TvT or TvP one but TvZ was my strongest by far. It's pretty good, but there are a couple Tang guides floating out there with screenshots for literally every other sentence to show where basically each unit at what time. Big thanks for all the guides, great job! 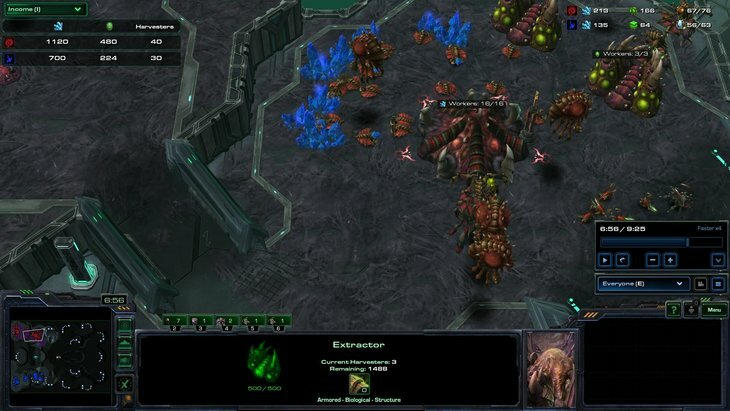 In you ZvT guide you have a similar all-in but with a few ravagers instead. Seems to me like the ZvT build just packs a bigger punch. So I'm wondering if the build in this guide is preferable against P and if so why? Yeah the Roach-Ravager timing can definitely be used for ZvP too. It arrives slightly later, which is why I tend to prefer the Roach-Ling, but the Roach-Ravager has other benefits like it's more deceptive because you can remove from gas until after the Zerglings chase the probe away. It's funny I actually did both builds back to back on ladder today against the same opponent, and he definitely wasn't expecting it the second time because I did remove drones from gas until the Probe was chased away. Sorry to necro an old post but wouldn't 1 adept (very common) pretty much wreck any early ling aggression? No overcharge needed. Yesterday was Tomorrow two days ago.